Exhibition Entitled "When You Relax II"
Pon, pon. Full, rounded flowers bloom here and there all looking quite humorous. A red flower, a black flower, a big flower, and a tiny flower. 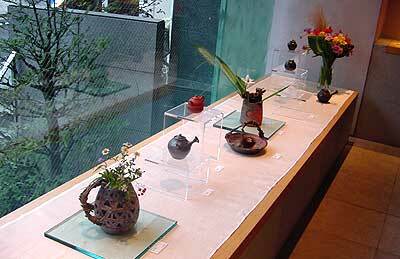 All those warm flowers are really highly original Tokoname kyusu (teapots). 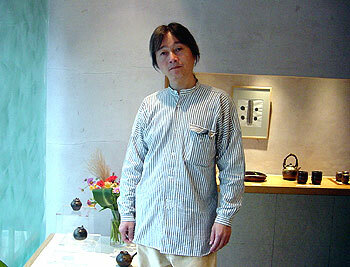 I visited the exhibition of the Tokoname potter, Yamada Emu, at Gallery Yufuku in Minami Aoyama, Tokyo. The exhibition's title was "When You Relax II." Let's have some good tea made with an extraordinary kyusu. Q: So many kyusu. They're so interesting. A. Not many exhibitions have that many kyusu lined up like this. This is my fourth exhibition here, and I especially focused on kyusu this time. The popularity of kyusu is rising. A. Yes. Tea is an "in-thing" these days. The health-consciousness boom might be affecting it, but there are more and more people looking for a fine kyusu. Q: For kyusu, do you think the bottom line is to make them functional? A. Yes. It has to be easy to use. Technically, kyusu are extremely difficult to make. There are many different components: a lid, hand (handle), and lip (or stroup). Those many parts get put together to be one kyusu. 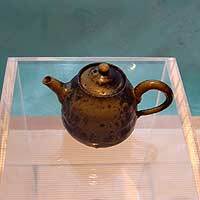 On top of that, it is a tool for making tea, so it has to be easy to use and must not make a mess with a leaky bottom. A. If tea streams out, it gets leaky around the lip, you know! Q: Oh I see. The water runs down to the bottom. A. Yes. It is not good if the water runs down to the bottom of kyusu. So I make kyusu with artifices. Q: How do you make a kyusu to prevent it from having a leaky bottom? A. Well, there are many elements, for instance, the way to cut the lip, the thickness of the lip, the angle. You try and figure it out along the way. I make it and fire it. I check on everything by myself. We actually tried his kyusu at the exhibition. There was no leaking at all, of course. Q: What is the process of making a kyusu? A. First, I make the torso on a wheel. Next comes the lid, handle, and lip, in that order. They are made separately as components. Then, I let them dry for a day. When they are semi-dry on the next day, I cut them a little to give them a good angle and then I put them together. The lid is especially a lot of trouble. The lid is made according to a subtly measured size. But it could be too tight, and then I have to scrape it to fit. Q: I heard that you fire kyusu with the lid on. Q: How come they do not stick together? A. There is a special kind of clay to set them apart. If we fired them together as they were, they would stick together as a matter of course. So in order to prevent that, we place a special clay between them, like a sandwich. Q: About the colors of your kyusu. There are reddish ones and dark brownish ones. A. The red ones are called Shudei. Shudei kyusu is a specialty product of Tokoname. They are fired in a gas-fired kiln now. The brown ones are unglazed (yakishime) kyusu. 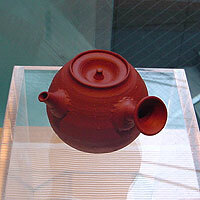 Unglazed kyusu was also developed in Tokoname a long time ago. Those unglazed ones are fired thoroughly in a wood-fired kiln for about one week. That is why the prices of those pieces are little higher than shudei pieces, but unglazed pieces have savor or taste that shudei pieces don't have. Of course, which one a person likes better depends on his or her preference. Q: As I am looking at your kyusu, I feel like drinking tea. (laugh) Should I go for sen-cha? 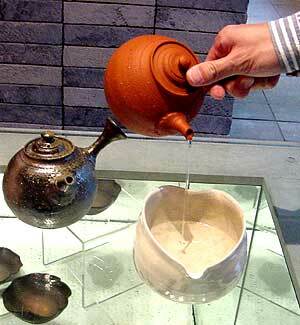 A. Yeah, sen-cha or ban-cha (coarse green tea), something that you can enjoy in everyday life. You could also enjoy Chinese tea. 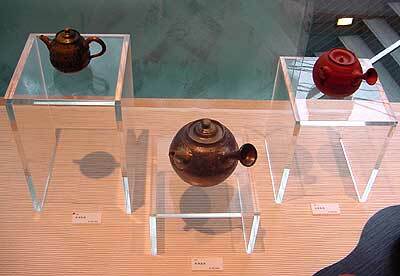 There are different sizes of kyusu depending on the kinds of tea you drink. Q: Let's have a look at your pieces keeping that thought in mind. A. To begin with, this kyusu. A. Among sen-cha, if you are to have good quality tea like Gyokuro (refined green tea), you want to use a small kyusu because you do not drink a lot of it. 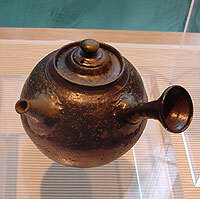 The roots of a small-sized kyusu are from China, but after it was introduced to Japan, it was manipulated and improved upon. Q: Is this unglazed?  The color is between elegantly plain green and dark brown. This is a very pleasant color. A. Yes, this is unglazed. The natural ashes fell on the piece and changed it in the kiln (a process known as "yohen" in Japanese). A. A big-sized kyusu like this is for casual usage. For example, it is appropriate to use at times like when you finish a meal. For ban-cha, hoji-cha (roasted green tea), or genmai-cha (brown rice tea), you pour a lot of hot water in a rather big kyusu and enjoy it. Q: The big, full round shape is attractive. It would be nice for a family enjoying each other's company. A. This mid-sized kyusu is good for a couple living alone. Q: This beautiful shu-iro (Chinese vermillion) is opulent, yet deep. It is a nice size and looks like it's easy to use. A. As we have pointed out, the kyusu size that one wants varies according to the kind of tea being used or the number of people to be served. It's nice to have kyusu of various shapes and sizes for different lifestyles and usages. A lot of people are looking for a good kyusu. They think that they seldom come across an easy-to-use kyusu. What I learned at this exhibition is that there are so many people seeking a reasonably priced really good kyusu. Q: What do you plan to try in future? A. Well, seeing such good responses from people to my kyusu pushes me forward to try harder to create more kyusu of various sizes. I also would like to hear people's comments and opinions about my works. I am the maker, and the visitors are the users. So I would like to hear from the people who use my works. That is why exhibitions are valuable. It gives me the opportunity to talk to a lot of people face to face. That provides me with useful information and motivates me.